These books are similar in describing horrendous childhood’s of upheaval and instability, complicated by mentally ill, vagabond, eccentric parents, and a sort of lower middle class poverty. (I know that’s an oxymoron, read the books and you’ll understand). But the similarities go much further and deeper. Each author is a brilliant writer, with an uncanny ability to recount his or her traumatic childhoods without self-pity. They don’t seem to hold resentment towards their incompetent parents. In fact they are able to recognize the strengths in their parent’s oddity and the positive aspects of their personalities. They find in their chaotic childhood experience, grist for creative tour de-forces, in each of these four memoirs. Please see prior review of “Glass Castle”. I will review “Angela’s Ashes,” soon. Tobias and Geoffrey Wolff are brothers. Geoffrey is eight years older than Tobias. When their parents divorce, Geoffrey heads off to live with his father and Tobias goes with his mother. Arthur Wolff was a Yalie, fighter pilot, and ersatz aviation engineer, who was also a vagabond, con-man, flim-flam-man, forger and alcoholic. 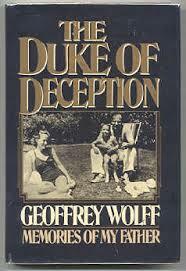 In the “”The Duke of Deception,” Geoffrey describes his chaotic life with his crazy father who bilks and cons everyone he meets, including friends, associates, wives, and Geoffrey himself. They move from place to place in continuous flight from debtors and jail. (They end up in La Jolla, where I was born and living at the time, with my father named Arthur and brother named Jeffrey.) Arthur forges credentials and lands a job as an aeronautical engineer at General Dynamics, where my friends parents worked at the time. Eventually Arthur is committed to a mental hospital and Geoffrey heads off to Princeton. Geoffrey’s descriptions of his father are brilliantly nuanced, remarkably sympathetic, and psychologically insightful. He says for example, ”As I dislike him more and more. I become more and more like him. I felt trapped.” This is a remarkable statement. As a therapist, one of the most difficult things to get across to people is the concept that without significant insight and effort, one tends to possess the very aspects of their own parents that they most despise. Geoffrey masters this in three short sentences. 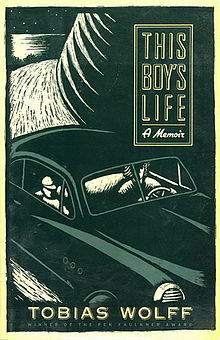 Tobias Wolff’s book starts in 1955 with ten year old Tobias, fleeing in a Nash Rambler that was continuously boiling over, with his mother, who was leaving one of a series of continuously violent relationships. They were driving from Florida to Utah and had broken down once again on the top of the Continental Divide, when a semi looses it’s brakes, screams it’s air horn in one long wail, and flies off the divide with Tobias and his mother watching. Tobias’s mother was moving to Florida to strike it rich mining uranium. Tobias and Geoffrey meet up once, after a six-year separation in La Jolla, just before Geoffrey leaves for Princeton, after their father is institutionalized. Tobias comes out by bus. Geoffrey spends the summer writing technical manuals for General Dynamic’s under his father’s name, while assigning Tobias daily reading requirements of all the Greek tragedies. I was younger at this time swimming at Windansea, right next to where they lived. Geoffrey eventually goes on to receive his Ph.D. in Literature, was nominated for a Pulitzer Prize, and was a Professor of Literature at University of California Irvine. He has published numerous highly acclaimed books. He had two sons and married a Clinical Social Worker. (I am a Clinical Social Worker. Weird coincidences). Tobias studied at Oxford, received his Master’s Degree in Creative Writing at Stanford and is a Professor of Creative Writing at Stanford. He also has written many highly acclaimed books. He married and had three children. A movie was made of the book, “This Boy’s Life,” starring Leonardo What’s His Name. Their mother eventually became President of the League of Women Voters. Truth is stranger than fiction. The relationship between the brothers remained close and mutually supportive since their time together in La Jolla. Both are considered two of America’s finest contemporary writers. It is remarkable and comforting to realize that all four of these authors overcame childhood’s of shocking hardship and trauma, and used their experiences to write creative, beautiful, and inspiring memoirs. ← The Butterflies Are Migrating at The Holler. Thanks for the suggestion. Your review was powerful enough to make me record all four (five) books. I too will have to get ahold of them to read during our long cold, snowy winter. I thought of you when I re-read Tobias’s description of the the semi flying off the divide. Did you ever drive over it in Colorado? From Aspen to Denver? I hiked up there. 14,400 feet or so. Gave me a headache. Can’t imagine the last flight of the driver. Eunice, I am waiting for you to write your memoir. I’ll be your editor! I agree with you on non-fiction! It is definitely more exciting, poignant and life-affirming. Excellent post!!! I feel like I know you! You are so kind. Thank you! Great review, very curious to read these now, especially “The Duke of Deception” which sounds fascinating. Glad I sparked your interest and will be interested in your thoughts! Thanks for commenting. Having a psychology degree, this sounds like an interesting read. Yes, that is probably one reason why I gravitate to them as well. Thanks for commenting! Have read Angela’s Ashes and it was an excellent read. Not familiar with the others but will have to look for them. Thanks for the suggestions. If you liked Angela’s Ashes, you’ll definitely like the others. Angela’s Ashes was bleaker, the others less so, with more humor. Thanks for visiting and commenting. Very good review, I will put them on my to read list. I have read Angela’s Ashes many years ago and enjoyed it. You might like “A Child Called It,” also a true story of a boy who overcame a horrendous childhood. It has a couple sequels which complete the story as he grows into an adult and father. Yes I read it. Harrowing/Sad. Thanks for the thought and for visiting!